Cleaning, Exam and X-Rays Only $99. In absence of gum disease. If your emergency is life-threatening, dial 911 for Emergency Medical Services. During opening hours, please call (281) 540-1141 for same day emergency care. Welcome to Humble Smiles - Ph (281) 540-1141, Humble Dentist. 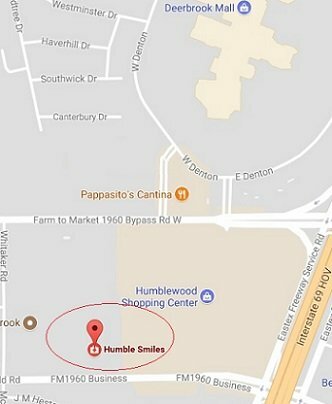 Welcome you to Humble Smiles located in Humble, TX , 77338 for Cosmetic Dentistry, pediatric dentistry, periodontics, oral surgery , dental implants and for Smile Design and Smile Restoration serving people in and around Humble TX, Kingwood TX, Atascocita TX. Sheeba George Robert DDS is a LVI (Las Vegas Institute for Advanced Dental Studies) trained cosmetic dentist and can give you the perfect smile you deserve. Certified by Baylor College of Dentistry for dental implants. Whether you are missing one or all of your teeth, dental implant procedures can restore a lasting smile and sense of well-being. Call us for free Dental Implants consultation. Visit our smile gallery. We offer Cosmetic Dentistry, Dental Implants, Veeneers, General Dentistry, full mouth dental restorations that look, feel, and function like healthy, natural teeth. You can rely on the expertise of our doctor. As implant dentist, doctor can place and restore your dental implants To us, the goal in restorative dentistry is to mimic nature’s finest esthetics, while ensuring dependable, durable dentition. Our philosophy is that a healthy smile begins with preventive care and a balanced bite and continues with aesthetic enhancements to give you the brightest and most natural smile possible. We are committed to providing you with complete dental services for your healthy smile. At HUMBLE SMILES, we know that when you’re searching for a dentist, you’re looking for more than a pair of hands to manage your teeth. Comfort, atmosphere, quality, affordability… all of these things and more factor into your decision. If a small, personalized practice complete with a dedicated team and skilled dentist sound like music to your ears, then you’re in the right place. Dr. Sheeba George Robert and our team focus on personal relationships with patients. We want to get to know you before we recommend treatment options. We want to create lasting relationships grounded in trust and mutual respect. We want to offer custom treatment plans with state-of-the-art options, catered to your unique needs. At HUMBLE SMILES, smiles (and the people behind them!) are our passion. We’re not your average family dentist, either. We specialize in an excellent hygiene program, as well as procedures for full-mouth reconstruction. Our comfortably-appointed office relaxes patients and maximizes efficiency. Your visit should be soothing, rewarding, and not dissimilar from visiting a family friend. At Humble Smiles, YOU always come first. Caring for all your Dental needs like teeth whitening , Tooth Pain , Gum Disease, Same Day Dental Emergency Care, Extractions, Dental Implants, Veeners, Cosmetic Dentistry, Dentures, Crowns, Bridges, Partials and more. Please call. General Dentistry - Braces - Implants. We invite you to use this website as a resource for information about us, new patient forms, and oral health news. Please call our Humble dental office at (281) 540-1141 if you have any questions or to schedule your first visit. Our Humble, TX dental office welcomes patients from Atascocita, Kingwood, Porter, The Woodlands, Spring, and surrounding areas. Welcome to our dental family! The American Academy of Pediatrics advises that children see a dentist by their first birthday, or when their first tooth begins to erupt. We gladly see children and infants age 6 months and older for routine exams, cleanings, and X-rays. We also provide protective sealants and fluoride treatments to keep your child’s teeth healthy. We provide affordable dental implants to replace missing teeth and give you the beautiful smile that you deserve. Call today. Our Dentist does tooth extractions when the tooth is too damaged or decayed, or when they are badly placed or are crowding the other teeth. Call today. Ask us today on how we can straighten your teeth in months instead of years. We have various options from Fast braces to Clear braces. Call today. Alternately, clear braces / aligners are the virtually invisible way to improve your smile. Exam and X-Rays Only $59. New Patient only. Cleaning, Exam and X-Rays Only $99. In absence of gum disease and new patient only. News Letter - A Beautiful Smile Is Precious And Priceless. Enamel Wear -- Chewing, cleaning and the normal aging process means your teeth will eventually wear down over time. Darker Tooth Color -- Aging dentin (the tooth's middle layer) holds stains easier than younger dentin, making your teeth appear slightly darker. Gum Changes -- Aging gums naturally recede over time. Cavities -- Cavities around the root of the tooth are more common as you age. Any fillings you have are also aging and can weaken or crack. Tooth Loss -- Dental cavities and gum disease are the leading culprits of tooth loss in seniors, but neither is a normal part of aging. If your teeth and gums are healthy, there's no reason why your teeth should fall out. Bleeding Gums -- Bleeding gums are a sign of periodontal (gum) disease, a leading cause of tooth loss in seniors. But gum disease is not an inevitable result of aging; it's caused by the build up of plaque. Left untreated, gum disease is linked to other health concerns like arthritis and heart disease.